Get your body bikini-ready with weights and swimming. Getting toned is a case of reducing body fat while increasing muscle mass slightly to make your muscles look leaner and more defined. The best approach is a combination of resistance training, cardio and the all-important diet. For an added challenge and to make your training more interesting, swap your running and gym machines for cardio sessions in the pool. Lifting weights isn't just about building muscle -- it helps to boost your metabolism, burns calories and speeds up the toning process. Perform two to three total body sessions each week. These are better for fat burning and definition that body part split workouts, according to Marc Perry, author of "The Get Lean Guide." Don't be fooled into thinking you have to use light weights for high reps though -- the idea that this is better for toning is false. Pick four to five exercises and perform three tough sets of eight to 12 reps on each. Swimming in itself is a great calorie-burner, notching up between 180 and 330 calories per half-hour session for a 125-pound woman, depending on what stroke you do. The American Heart Association recommend a minimum of 75 minutes of vigorous or 150 minutes of moderate cardio each week. 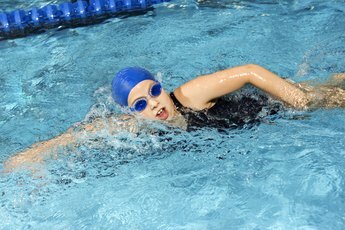 You can do this all in the pool, or switch between swimming and other forms of cardio such as cycling or playing sports. Interval training is superior to steady-state cardio, claims Rachel Cosgrove, trainer and owner of Results Fitness in California in an interview with Fox News. Instead of just swimming at the same pace for 30 minutes, try swimming one length as fast as you can, then reducing your pace for two to three lengths and repeating this protocol for half an hour. For an alternative approach to interval training in the pool, tread water non-stop for a minute, then take a break for a few minutes to swim light laps and repeat this in the same manner. Aim to increase the intensity of both your toning workouts and your swimming sessions each week. You can do this by upping the weights and reps in the gym and making your swimming sessions longer or adding on extra intervals. Interval training and treading water in the pool count as vigorous training, while slow and steady swimming is moderate intensity, so split your training time between the two to meet your weekly cardio quota. For best results, eat a calorie-controlled diet to help speed up fat loss. What Burns More Calories, Swimming or Weight Lifting? 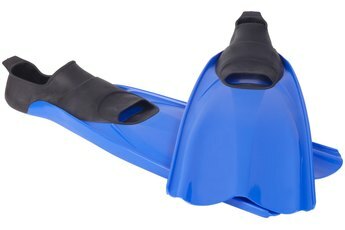 Do Swim Fins Tone Your Legs?